She has graced the pages of Mimi magazine, landed a nomination on a hit African entertainment award show and now she is an exclusive feature and cover model for Vanguard’s, Allure Magazine. 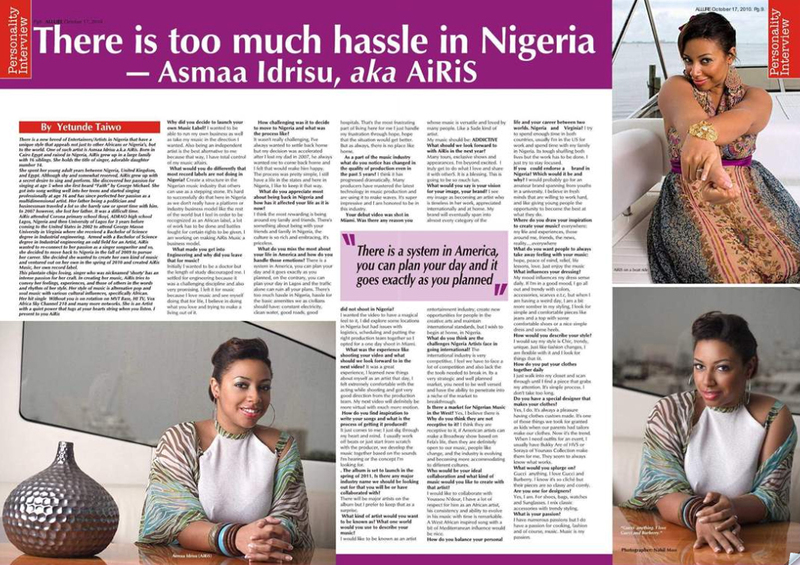 In the exclusive interview, Airis gives readers a deeper look into her music, her childhood and her aspirations. In the interview, Airis discusses growing up in Nigeria and discovering her love for music at an early age and her journey to the United States to pursue studies in Engineering. “Originally, I wanted to be a doctor, but the length of study discouraged me. I settled for engineering because it was a challenging discipline and also very promising.” She eventually reconnected with her passion and ventured out to start her own music label, Airis Music 2010. To learn more about Airis and her music, please visit www.airismusic.com. You can also connect with her via twitter @airismusic.